Ion channels control many essential functions in the cell, including chemical signalling, regulation of pH, transcellular transport and regulation of cell volume. 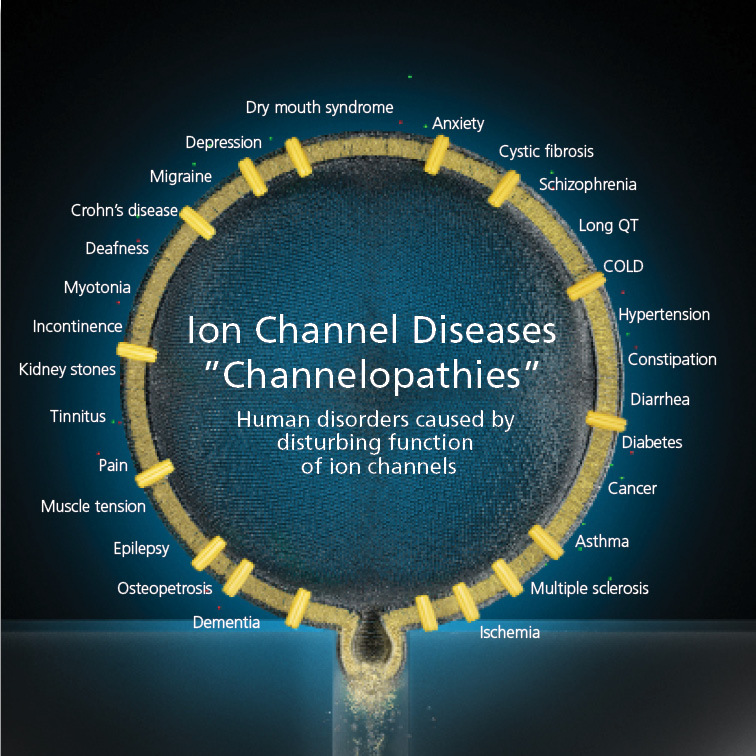 Abnormal function of ion channels can cause a diverse range of diseases, socalled channelopathies. The number of diseases related to ion channel malfunction are increasing and with that the amount of potential drugable ion channel targets. Examples of channelopathies are Cystic fibrosis (CFTRT, TMEM16), epilepsy (Kv7.2/KCNQ2), but ion channels are involved in diseases in many areas such as Cardiac, Genitourinary, Metabolic, Gastrointestinal, Stroke, Pain/Inflammation, Psychiatric Disorders, Pulmonary/Respiratory and Seizures/Convulsions. More and more evidence shows that ion channels could be a relevant target for cancer treatments as well.